Look here first to browse our FAQs for quick answers to your questions about Tree Top and our products. Click here to learn where to buy your favorite Tree Top products. Find helpful information about requesting product donations for your Yakima Valley 501(c)3. Click here to see information about each of Tree Top’s processing facilities. Industry Professionals click here to visit our Foodservice pages. Food Manufacturers click here to visit our Ingredients pages. 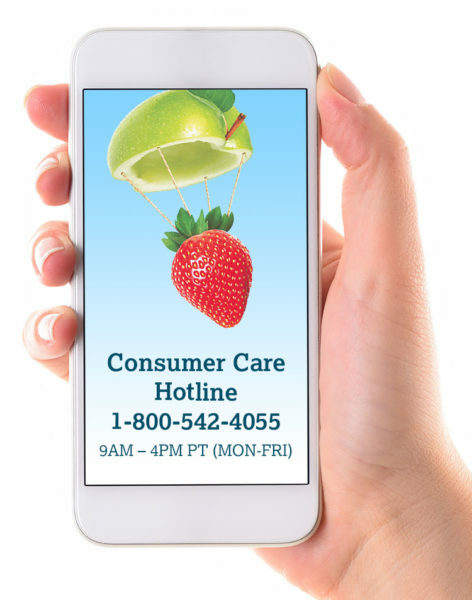 Please note: Our consumer care team monitors and responds to these inquiries 9AM-4PM PT, MON-FRI.
For product concerns, please retain the product and packaging until our Consumer Care team has contacted you. We may send you a product retrieval kit or ask you to provide a photo of the product, of the code date and of the best by date. As an alternative to completing the form below, product concerns may instead be submitted to us via Facebook Messenger, along with the related product photographs, by clicking here. Allowed file types: jpg, jpeg, png. Max file size: 10MB.